To Sum It Up: Twins Victor and Konrad Frankenstein live in the magnificent Frankenstein mansion along with their ultra liberal parents, their two younger brothers, and their distant cousin, Elizabeth. The Frankenstein manor is filled with hidden passages and rooms. 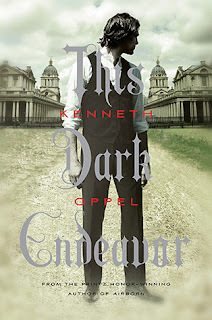 Konrad, Victor, Elizabeth, and their best friend, Henry, have found many of its secrets but not all of them. One day, the four adventurers stumble upon a secret library within their own library. The Dark Library is filled with books on magic and alchemy. Victor and Konrad's father finds out and forbids them from returning to the Dark Library, claiming it is all foolishness, but when Konrad falls ill and the doctors cannot help, Victor, Elizabeth, and Henry turn to the Dark Library in order to save Konrad's life. Review: First off, the Frankenstein mansion is amazing (I want to live there!). Secrets galore! Now to business. The book had a very dark feel to it, and that was something that really appealed to me. My favorite part of the book was, hands down, the story line. The plot was inventive and creative, and that is something I value heavily in a book. And yes, I say it alllll the time, but it’s only because it is absolutely true! There was so much intricate complexity, the book felt like an antique desk with hundreds of secret compartments. It was easy to see how much forethought went into the story. That being said, the story wasn't at all confusing. That also being said, it wasn't at all boring. I wasn't crazy about the characters. I found that I could not connect with them because I felt some of them lacked a lot personality-wise. I did not hate them, and I felt like they had the potential to be lovable characters. Victor for instance was not a perfect guy, but he did love his brother. I felt like I could have understood Victor a lot better if he hadn't seemed to completely forget about his brother every other chapter. I mean, the things he went through for his brother really were admirable, but it seemed like he was only fully devoted to his brother at irregular intervals. I could identify with the sibling rivalry, but sometimes it felt like he was talking about an acquaintance and not his brother, Konrad. I also felt Elizabeth was rather irregular. At times she was very likable, kind of a tomboy, and very determined. Other times she was practically a completely different character! The inconsistency of these characters is what kept me from becoming attached to them. Konrad and Henry were far more likable, but they were only minor characters. The end was disappointing to say the least. It vaguely reminded me of how absolutely enraged I was with the ending of The Alchemist. (Note to self: write rant about The Alchemist.) All I can say is, it fit, but it didn't. I have very mixed feelings about it. I wish I could dive into a whole analysis of it, but that would give away everything. So I'll shut up for now, and if I feel especially motivated about it, I may write a rant. All in All: This was a very clever book. The biggest issue was that the characters were only so-so. Otherwise, I really enjoyed it. Thank you for the review. I have this and the 2nd book on my tbr, but I haven't read them yet. Something about them intrigues me, but not enough to pick them up and read. Maybe I will read them soon. This one sounds interesting! I love good mansions or big houses/castles/everything in books! The characters do sound kind of off, especially how Victor acts about his brother. Inconsistency with characters is the worst! And oh no, disappointing endings! I hate when there are more feelings you want to explain but you can't because it would ruin big parts of the story, sometimes I need to say more!! The cover rocks! Too bad the characters did not. I am very character driven so this would probably be a hard read for me. The cover is beautiful! It's too bad the story didn't match it! I have had this on my kindle forever but I have not yet read it..maybe sometime in the future!